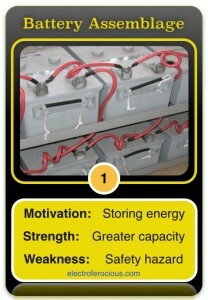 A battery assemblage is everything that it’s name implies: a collection of battery cells connected one to another. The usual purpose of this assemblage is to store energy in larger quantities than is possible with a single battery cell. On the Big Island of Hawaii, as elsewhere, these types of systems are connected to rural residents’ solar panel arrays. Lead acid batteries can be configured as a Level 1 battery system for this off-grid application with significantly less safety risk than if a Lithium ion battery was configured in similar fashion. The spectacular failures that resulted from attempts to connect (and operate) large numbers of Lithium ion battery cells together without appropriate battery management or charging hardware is what spurred development of Level 2 battery systems.